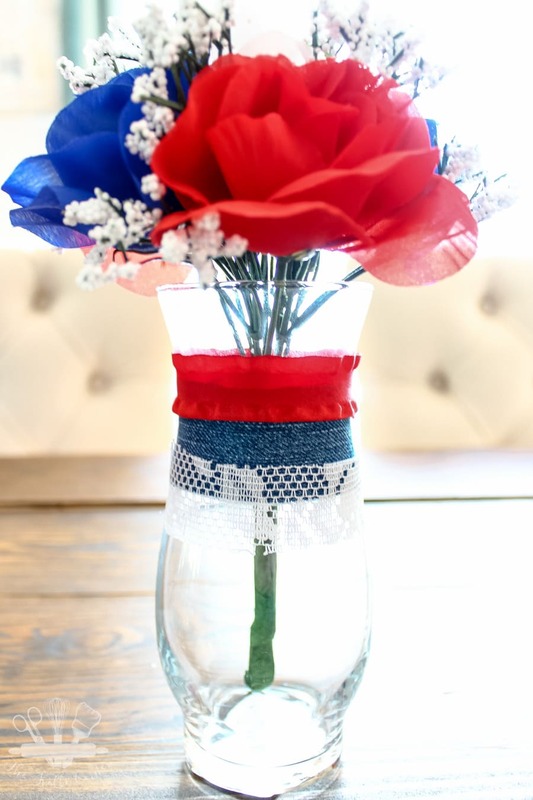 I have a super easy project for patriotic vases made using items from Dollar Tree. Holiday decor that comes together in less than 30 minutes! This post contains affiliate links for your convenience. You can read my full disclosure policy here for more information. When my husband and I lived in Tennessee, we loved to throw parties. We especially enjoyed having summer cookouts and gatherings because we had a huge outdoor area to entertain. Since then we have moved quite a few times and making new friends is always a little difficult at first. We are fortunate that in San Antonio, we’ve made fast friends with co-workers and can get back to entertaining. And that is exactly what we did last weekend! We hosted an adult game night where we played games like Card’s Against Humanity, Exploding Kittens, and Head’s Up. It was so much fun to get everyone together outside of work, eat, drink and enjoy each other’s company. So why am I telling you all of this? 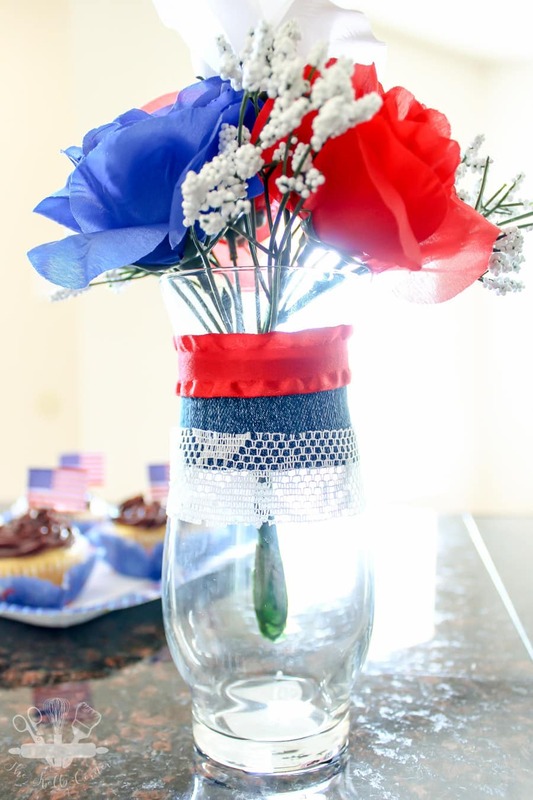 Because I decided to give my party a red white and blue theme by whipping up these really easy diy patriotic vases. I was inspired to create these simple centerpieces when I was at the Dollar Tree last week for some other party supplies. 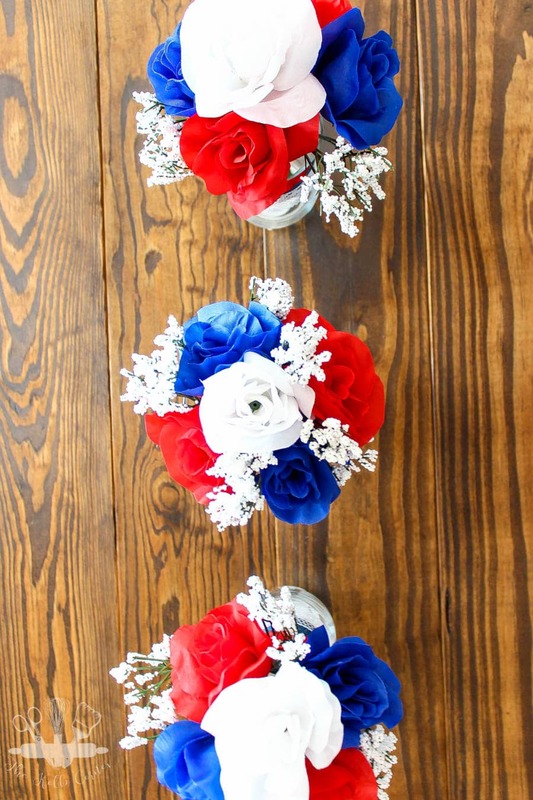 These patriotic vases were so easy to put together! I don’t have any step by step photos because I literally whipped these up in 30 minutes, right before my guests were arriving for the party. But the steps are so easy, I have full confidence you can make these on your own without the photos. Start by cutting the flowers into individual stems. Arrange the flowers into a grouping however you want, and bind the stems together with floral tape. Set aside. Cut the ribbon, old blue jeans and lace into strips that will fit around the width of the vase. Be sure to cut the blue jeans wider than the ribbon and lace strips so that it will peak through. 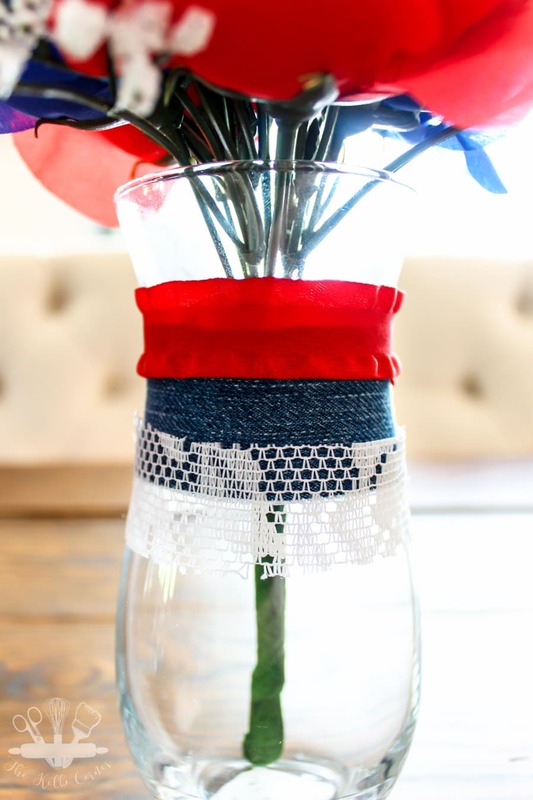 Wrap a blue jean strip around the vase and secure with hot glue. Layer the red ribbon at the top of the jeans and glue. Then wrap the lace around the bottom portion of the jeans and glue. I used these to decorate the food table as well as the dining table where we gathered to play games. Don’t worry, the recipe for those cupcakes is coming soon! The best part about this project is I spent $7 for 3 decorative vases since I had the red ribbon, jeans and lace already. 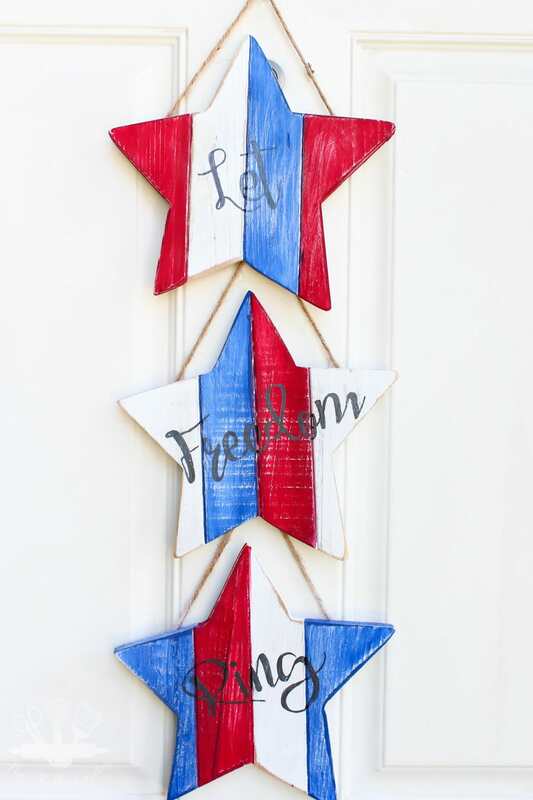 More red white and blue decor you’ll love! 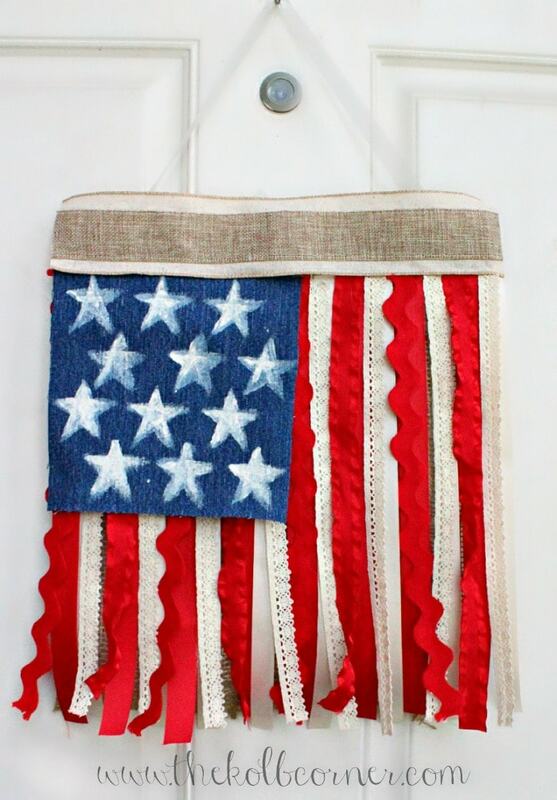 These are perfect for the 4th of July!